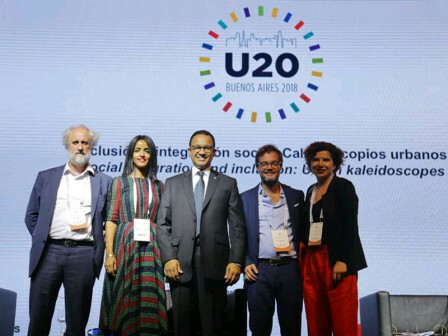 Jakarta Governor, Anies Baswedan becomes a panelist for Social Integration and Inclusion at Urban 20 (U20) Mayors Summit in Buenos Aires, Argentina.
" It is City 4.0 approach where in the future, city government is not only functioned as service provider and resident is not only as a customer"
Anies said, this moment is also a chance for Jakarta to share about Jakarta Government initiatives related to social integration and inclusion to the world, such as implementing Community Action Plan (CAP) Program in 16 villages in the Capital. "Residents are actively involved in this program and they are given the authority to make decision regarding management and arrangement in their villages," he conveyed as it is written in his official Facebook account, Tuesday (10/30). His side is committed to make various places in Jakarta, including main roads, as the 'third place' for residents to interact, gather, and greet each others, while enjoying arts, cultures, and sports. He mentioned, city government should be a facilitator and collaborator while each resident has a role as participant and co-creator in various city management aspects. "It is City 4.0 approach where in the future, city government is not only functioned as service provider and resident is not only as a customer," he added. As previously reported, U20 Mayors Summit is a discussion platform between mayors to convey collective message and inclusive solution regarding city's significant roles in sustainable development to G20 leaders. It is initiated by Paris Mayor as the leader of C40 Cities Climate for Leadership Group and Buenos Aires Mayor as the city host for G20 in 2018. U20 Mayors Summit is held with cooperation between C40 international city government association and United Cities and Local Government (UCLG). This first event is supported by 26 cities of G20 member countries. Those are Barcelona, Beijing, Berlin, City of Buenos Aires, Chicago, Durban, Hamburg, Jakarta, Johannesburg, London, and Los Angeles. Then, Madrid, Houston, Mexico City, Milan, Montreal, Moscow, New York, Paris, Rio de Janeiro, Rome, Sao Paulo, Seoul, Sydney, Tokyo, and Tshwane. Result of initiatives collected from all participants will be written in Joint Letter from U20 Mayors to G20 Leaders, Action Plan, and Communique which is the concrete recommendation to G20 Leaders about how U20 can support cities in implementing G20 priority schedules.